were graciously provided by Captain Lees' daughter. My father was born Erhard Wilhelm Wolf SAAR in 1921 in the then-German city of STETTIN [ now Szczecin, Poland], where his father was stationed as a regular soldier. His mother was from Stettin originally. However,when my father was a toddler his parents divorced and my father went to live with his grandparents and his father in the centre of Berlin. His grandfather was a master tailor and had a flourishing business in Berlin. My father lived there until 1934 when, as a 13 year old, he was sent out of Germany by his family. The situation was becoming increasingly dangerous - since not only were the family jewish, but my grandfather was a known anti-Nazi activist in the Communist party and he was being persecuted for his political activities. My father travelled alone to England - under the protection of the Quakers, who brought many children and adults out of Germany in the 1930's. He travelled by sea, via the Hook of Holland and Harwich and eventually ended up in Manchester with a jewish family who fostered him for a while. I'm not quite sure of what happened over the next few years, other than he went to a grammar school in Manchester and retained very fond memories of his time with this foster family. He kept in touch with them for many years afterwards. Eventually, I can only surmise that he had to leave school at 15 or 16 and went into one of the only types of training that "enemy aliens" were allowed to do in the late 1930s i.e. horticulural and agricultural training. From 1938 until 1940 he worked for the Cooperative Wholesale society in Cheshire as a trainee. Some time in the late 1930s my father changed his name to Edward LEES - taking the name of a family he was lodging with in Cheshire at the time. I guess it was not helpful to retain a German name at that time in the UK !! In 1940 he was, like so many others in his position, interned for 6weeks - in the Liverpool area I think. On release he joined the Pioneer Corps - at that time the only Corps open to "enemy aliens". After extensive SOE para-military and parachute training he was commissioned in early 1944 as a Lieutenant, and later to the rank of Captain. During his years in SOE he was parachuted in to the Dolomites in Northern Italy where he worked with the local partisans on a variety of sabotage missions. His speciality was setting explosives and he was nicknamed "il Dynamitard' by the Italiens. He remained in Italy doing this work until the end of the war. In 1945 he was posted to Special Camp 11 as an intelligence officer and interpreter, holding the rank of Captain in the regular Army. 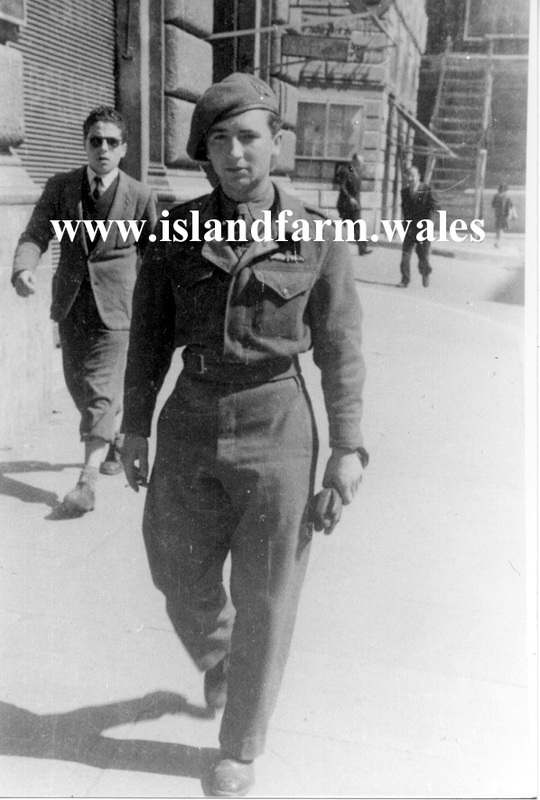 My father remained in the army until just before I was born in Bridgend in 1948. By that time he had met and married my mother - who lived in Cefn Cribwr. He was naturalized as a British subject in 1946. He then joined Glamorgan Fire Service and stayed with them until his retirement in 1977 - ending his career as a senior staff officer. He was the official german interpreter for Glamorgan County Council in the 1950s and 1960s and was often released from his Fire Service duties in order to interpret for German civic dignitaries visiting their counterparts in the County. He also retained his reserve commission as Captain until well into his fifties. My father was a very quiet man who didn't talk much about his early childhood - probably it being too painful since he lost all his family in the War. He didn't ever blow his own trumpet about his work in SOE. It is only since his death, and many of the documants on SOE now being made public, that I have come to realise just what a dangerous war my father had and how lucky he was to survive it. Most SOE agents didn't. My father did talk a little more about his time in Special Camp 11 and, surprisingly, he had a good deal of respect for the older, regular senior officers like von Runstedt and Voss. I know, from the letters and cards I have from some of those officers - sent to my father - that he always treated them with dignity and respect. The officers he hated were the former SS officers who were out and out Nazis and would always be so - in my father's view. My father never wanted to return to Berlin. His old childhood home was, in any case,in the former East Berlin and he would not have been allowed in. In any case, he didn't want to go and, of course, by the time the Wall came down, my father had died. My mother died prematurely in 1978 and my father re-married briefly in the early 1980s but died of a sudden heart attack in 1985 - at the early age of 64. It is only since his death that I have done a great deal of research in order to recover my father's and his family's history.